Farmgirl Fare: Sunday Dose of Cute: Happy Father's Day! That picture is absolutely hilarious! Poor soggy, muddy Dan. Then again, maybe he was enjoying having rolled around and gotten dirty. As you wrote in one of your earliest Donkey Doodle Dandy posts, "It's hard to know exactly what Dan is thinking." Dan will be so much happier living with the girls, and you'll have less work, too. When you need a daddy donk again, maybe you can rent a mini jack. Or a zebra. That should scare coyotes. we practice line breeding with goats also - can go down the line but not up or sideways - have had some beautiful animals that way but also sold off our buck and NO MORE babies. 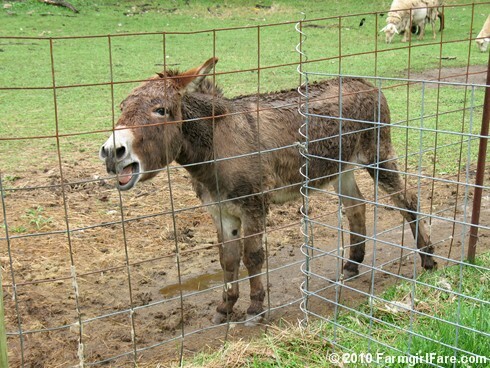 Can you wether (or neuter or whatever it is called for donkeys) at his age? In goats neutering after they have reached adulthood seems to result in a very surly goat - I can't really blame them - how ya gonna keep 'em down on the farm after they've seen Paree - allegorically speaking or metaphorically or tired from triple digit heat and need to sign off ically! I just found your blog,, your "about me" sounds a little like our farming adventure. How I love the farm lifestyle. We had to castrate all our stallions so they could be free to live with the other horses. We ended up with 18 horses, 85 cows, 15 sheep, 10 dogs, 5 cats, ducks, geese, 35 chickens. We still have one stallion pony because they say he's too old to castrate and he does get out every now and then. Our numbers have been reduced but it's still a considerable amount of animals to care for. I do love it though, and have learnt so much. It's a wonderful life for the children.